As I’ve mentioned before, I love fortune cookies. Not just because a fresh one tastes great, but I’ve also used the fortunes as a writing challenge. I have two bowls of fortunes in my house. One with the not so good ones, and one with the potentials. The potentials are fortunes I might be able to write into a book. This has been my challenge on my last three books, find a way to elegantly work in a few of my fortunes. 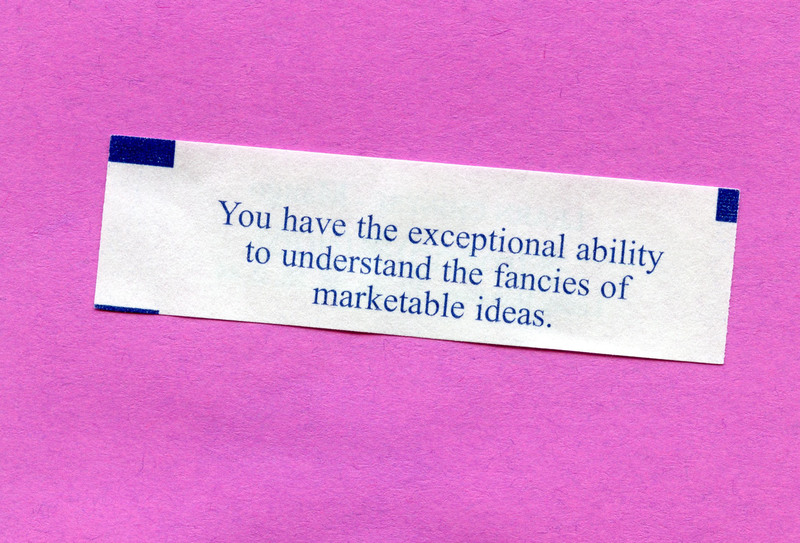 WTF does “You have the exceptional ability to understand the fancies of marketable ideas” mean? I mean what drunk guy at the fortune cookie factory came up with that one? I mean it’s so bad, I kinda want to find a way to put it in a book. I mean, THAT would be a challenge. I guess I just have to figure out what it means first …. no easy task to be sure. So does anyone out there have a clue what my fortune means?? ?